Muscle Building is not just about sweating it out in the gym. Those size and strength gains are going to be a lot more difficult to achieve and maintain if you're not putting the right fuel in. Eating a healthy diet that supports you through the stress of serious muscle building is probably the best thing you can do for your body. It will keep you feeling healthy and motivated, and it will maximise results. Eggs were the original protein supplement. Remember when bodybuilders used to knock back raw eggs by the glass? 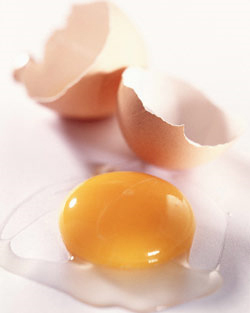 Apart from their high protein content, eggs are rich in vitamins, minerals, and essential fatty acids, including omega-3. Eggs are super easy to cook, they'll go in anything from breakfast to dessert, and a boiled egg is a great, healthy on the go snack. While it's a shame to lose the nutrients in the yolk, egg white is a fat free source of protein, and the egg white omelette is popular for good reason. Resisting the urge to delve into tedious "which came first" jokes, chicken is a great source of lean protein. Boneless, skinless chicken breasts are part of the bodybuilding staple diet for many. For those bored with chicken, try mixing it up with turkey breast, which has a stronger flavour, and is lower in calories. The protein content of turkey is lower, but for the same amount of calories, you can eat more lean turkey breast, which is great for big appetites. Red meat is, of course, high up on this list. Round and sirloin cuts of beef are great in terms of protein to fat ratio, and if you can bring yourself to chow down on a national icon, kangaroo is even better, being one of the leanest and highest protein red meats around. These super lean cuts of meat can be quite tough, so they're best marinated before cooking, or braised in liquid. Lean ground beef is a healthy and versatile way to get protein, and beef jerky is a great protein-rich snack. Fish is not only a great source of protein - oily fish is probably nature's best source of essential fatty acids. In terms of lean fish, Tuna canned in spring water is very high in protein, low in fat, and so convenient. When it comes to oily fish, make sure you choose wild fish over farmed – farmed fish can be lower in essential fatty acids and other nutrients. Cottage cheese is a fantastic protein source with a great creamy texture. Use it to replace fattier options like sour cream, or eat it with fruit for dessert. Cottage cheese is very rich is casein, so it makes a great, long-acting night time protein. There are some other great non-meat protein options for vegetarians, or people who just want variety. Pulses are pretty good protein sources as well as containing good quality carbs. Add chick peas to a soup or a stew for a hearty meal or use lentils in place of ground beef if you're worried about your cholesterol. Nuts, like almonds, cashews, walnuts and pecans are rich in protein and good fats and are great for snacking, but have you considered nut butters? Add peanut butter to your breakfast shake for a tasty protein hit, or stir mild and creamy cashew butter through a stew, a curry, or even a stir fry to add richness, taste, and up the protein level. Tofu and other soy protein cops a bit of a bad rap, but eaten in moderation soy has no effect on testosterone levels, and tofu combines high protein with low fat. Look for the protein dense "firm" varieties. Marinate tofu in a protein rich peanut satay or add it to a healthy stir fry. Tofu novices take note, there are lots of delicious flavoured varieties on the market. With the rise in popularity of Atkins and Paleo, carbs have suffered from some negative press in recent times, but to make muscle, you need energy, and energy comes from carbs. 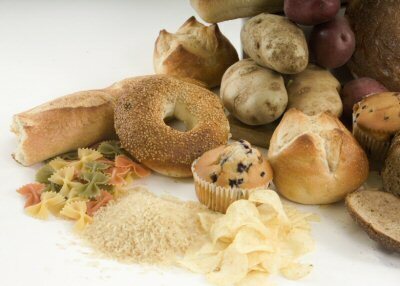 Believe it or not, the body also needs carbohydrates to burn fat stores. No carbohydrate is intrinsically "bad" - even simple sugars have their time and place, but eating the right sort of carbs at the right time can work wonders for making and sustaining lean gains. Staring at the beginning with breakfast, oats are one of the most popular muscle building foods for good reason. The complex carbohydrates provide lasting energy, and the mix of soluble and insoluble fibre is great for not only your digestion, but also your cardiovascular system – oats have been clinically proven to reduce LDL (bad) cholesterol levels. This mix of nutrients keeps you feeling full for a long time. They are also a versatile food which can be flavoured in many ways, and even blended and added to shakes for extra energy and creaminess. Oats are frequently included in mass gainers, and are great after a workout to replenish energy. On top of all this, they're very cheap. Another very popular source of long lasting carbs is sweet potato. Sweet potato is a versatile, satisfying food that can be eaten sweet or savoury. They come in many colours, and the darker varieties are packed with antioxidants. Sweet potato is easy to cook and cheap and can be used to replace high GI, calorie dense white potato in any meal. Fruit and vegetables are essential in a bodybuilder's diet. Apart from the vitamins and minerals, many fruits and vegetables are rich in micronutrients and antioxidants. They're essential for digestive health, and adding vegetables to a meal can really bulk it up, while costing relatively few calories, which is great when cutting. Variety is the key when it comes to fruit and vegetables, firstly to keep the diet interesting, and secondly to get a range of nutrients. A funny sounding, but surprisingly good recommendation is to try and eat as many different colours in a day as you can. Some good fruit and veg ideas are berries with oats at breakfast, banana for quick energy after a workout, beets to raise blood nitrates, and steamed greens with a main meal for vitamins, antioxidants, and bulk. Always try to eat whole fruit and vegetables – drinking fruit and vegetable juices instead deprives the body of nutrients and fibre. White bread might not be the best thing out there, but it does have a time and a place – after a workout, for example, when you need fast carbs to avoid burning muscle. Being aware of what you're eating, when, and how much, is a better strategy than outright banning certain types of food. As they say for good reason, everything in moderation. Fats are required in the diet for a number of reasons. Apart from outward benefits, like improving skin and hair, a good balance of fatty acids can lower cholesterol, improve cardiovascular health, help the passage of vitamins into the body, maintain efficient metabolism, and form the building blocks of many chemicals in the body, like testosterone. It is important to obtain fats from healthy sources. Some of these, like oily fish, nuts, and egg yolk have already been mentioned, there are a couple of other great sources worth mentioning. Avocado is a great natural source of monounsaturated fats, which are thought to be burned slowly for energy, rather than stored in to body reserves. It is also high in essential omega-6 fatty acid. Along with the good fats it provides, avocado is packed with nutrients, including vitamins C, E and K, folate and antioxidants. Ask any avocado fan, and they will tell you it goes well with everything. Olive oil is a great way to eat healthy fats. High olive oil consumption is a cornerstone of the Mediterranean Diet, a diet associated with long life expectency and cardiovascular health. Olive oil has a scientifically demonstrated ability to decrease the bad fats in the bloodstream, and it has antioxidant and anti-inflammatory properties, which are known to be of great help to the body when it's under stress, for example, during heavy training. Its high in healthy omega-9 fatty acids, and like avocado, is delicious and versatile. Many will be surprised by the inclusion of butter on this list, because we've been warned for so long against saturated fats. Nutrition experts now believe that eating a small amount of naturally derived saturated fat along with the monounsaturated and polyunsaturated fat we have been told about for years, is optimal for good health. Butter is a great source of vitamins A, D, E and K, along with conjugated linolenic acid, a form of fatty acid which has shown some ability in promoting metabolic health and fat loss. Eaten in moderation, dairy fats are good for you. This article has only covered a tiny number of the many foods out there that can support healthy muscle. In general terms, It is important to remember that variety is going to keep things interesting. Many people find diets that are too restrictive, monotonous or bland to be demoralising, and there is a risk of missing vital nutrients. Whatever your goals, an interesting an enjoyable diet is going to be easier to stick to than something that you do not look forward to eating. Bon appetit!